The Eighth Annual International Conference on Cyber Engagement will be held on April 23, 2019 in Washington, DC. Eli Wurtman of PICO Partners, Cheri McGuire of Standard Chartered Bank UK and Ping Li of Accel Partners discuss changing cybersecurity through investment, incubation and new technologies. Ms. Marietje Schaake, Member of European Parliament delivers a keynote address on the Rule of Law Online. 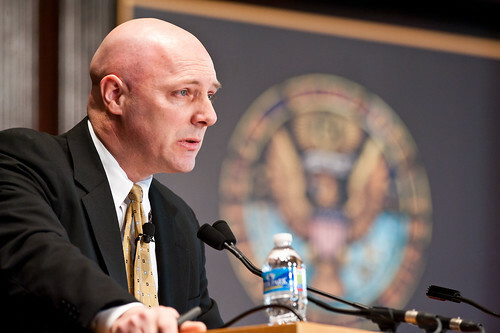 Former CIA Director, General Michael Hayden delivering a keynote address at the 2011 ICCE. Dr. Catherine Lotrionte and Secretary Kirstjen Nielsen at the November 14, 2018 ICCE Fall Planning Dinner. Registration for the International Conference on Cyber Engagement 2019: Building Commonality in a Dynamic Global Domain is now open. The eighth annual International Conference on Cyber Engagement (ICCE) will be held on April 23, 2019, at the Lisner Auditorium in Washington, DC. The International Conference on Cyber Engagement has been organized since 2011 by Dr. Catherine Lotrionte, founder of the International Conference on Cyber Engagement and Brent Scowcroft Scholar at the Atlantic Council. This year, it will be hosted for the first time by the Atlantic Council’s Scowcroft Center for Strategy and Security, in partnership with Dentons, PKO Bank Polski, and Texas A&M University. The International Conference on Cyber Engagement draws on the experience of government practitioners, industry representatives, and academic scholars to bring a multidisciplinary and global approach to challenges in cyberspace. Click here to view the full agenda with speakers in PDF form. The last International Conference on Cyber Engagement attracted over 800 participants from nearly 400 organizations—corporate, government, non-profit, and academic—representing 43 nations. The conference provides a unique opportunity for experts to engage in thought leadership and constructive dialogue with key individuals from technical, corporate, legal, and policy backgrounds. The conference also explores the worldwide community’s increasing interconnectivity in the cyber domain. Honoring General Brent Scowcroft's legacy of service, the Scowcroft Center for Strategy and Security works to develop sustainable, nonpartisan strategies to address the most important security challenges facing the United States and the world. By hosting ICCE, the Scowcroft Center seeks to look ahead to key trends shaping the future of cyberspace and to amplify expert voices to strengthen cyberspace governance to help manage growing challenges. In preparation for the 2019 conference, the Atlantic Council hosted the ICCE Fall Planning Dinner on November 14, 2018, to gather partners and future speakers and government and corporate leaders to shape the agenda for the conference and discuss pressing global cybersecurity issues. On April 22, 2019, the Atlantic Council will be hosting a pre-conference invite-only Speakers and Sponsors Dinner to hear from keynote speakers The Hon. John Demers, Assistant Attorney General for National Security at the US Department of Justice, and H.E. Tobias Feakin, Ambassador for Cyber Affairs at the Australian Department of Foreign Affairs and Trade, as well as convene cybersecurity experts and leaders ahead of the conference. The 2019 ICCE will be held at the George Washington University's Lisner Auditorium and Cloyd Heck Marvin Center. A map of the George Washington University campus can be found here. Parking is available throughout the George Washington University campus and can be found here. If you are taking public transit, the closest metro station is the Foggy Bottom-GWU Station, located here. Directions to the George Washington University campus from various local airports can be found here. Panel One: "Preparing Nations to be Cyber Ready"
Panel Two: "International Norms for Responsible State Behavior"
Lunch Panel Room AG: "The Wassenaar Arrangement: What it Means for the Future of Global Cybersecurity"
Lunch Panel Room BC: "EU-US Privacy Shield: What the Future Holds for Data Transfers Across the Atlantic"
Lunch Panel Room DE: "Cyber Accountability: Working Towards a Stable Cyberspace"
Lunch Panel Room FH: "Critical Services & Infrastructure: Protecting Vital Elements of Modern Society"
Panel Four: "Deterring Malicious Actions in Cyberspace Before They Happen: Different National Perspectives"
The focus of the Cyber Statecraft Initiative is to: 1) examine the nexus of geopolitics and national security with cyberspace; 2) continue to build out the new field of cyber safety in the Internet of Things; and 3) help build the next generation of cybersecurity and cyberspace policy professionals. Throughout all of its work, the Initiative focuses relentlessly on providing practical, innovative, and relevant solutions to the challenges in cyberspace. The Initiative brings together a diverse network of respected experts, bridging the gap between the technical and policy communities. Welcome and Opening Keynote: "Cybersecurity: A View from the Hill"